Mayra’s Spanish School supports several local volunteering and community programs. Not only are these fantastic opportunities to contribute to Ecuador’s ongoing development, but also a great chance for you to practice your Spanish with locals and improve your language skills. You will also make lasting friendships and memories for life. Mayra’s Spanish School supports a local community program called Fundacion Arte del Mundo. This volunteering program is a great way to improve your Spanish and help directly in the community! Arte del Mundo is the foundation and cultural center promoting the importance of reading in the local community through their childrens library called Biblioteca Interactiva de Baños (BIB). Volunteers will work with children from 6 to 12 years old. The library offers a variety of after school activities centered around the Arts. 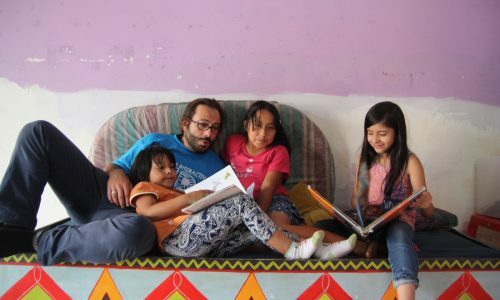 Volunteering is normally from 3 to 6 in the afternoon, with some later hours a few times a week for movie night and Spanish English language exchange.You will work along side other volunteers to help with activities such as; art, music, dance, theater games, yoga, science experiments, games, dress up, and cooking. This is a great way to practice Spanish and help directly in the community. Please click the link (picture) for more details. Merazonia is a dynamic wildlife rescue and rehabilitation centre located on 250 acres of Amazon rainforest, near Mera, Ecuador, South America. Located just an hour from Baños this is the perfect place to volunteer for those who love animals and the outdoors. It is a rare opportunity to work with a wide variety of animals all whilst experiencing the largest rainforest in the world, the Amazon, home to tens of thousand of tree species and thousands of animal species. Volunteers help in the day to day care of the wildlife, as well as rainforest conservation. Merazonia currently cares for around 100 animals, including: capuchin, woolly, red howler and tamarin monkeys; many species of parrots and macaws; kinkajous; small mammals; a puma and sometimes other felines. Here you will form lasting friendships with volunteers from all over the world and help preserve and protect one of the world’s most unique ecosystems. Please click the link (picture) for more information.